It's over. *combination sigh of relief/sob of despair* Now I must complete this end of event survey before I collapse from exhaustion. 1. Which hour was most daunting for you? hour 23...I actually fell asleep for 20 minutes and woke with a start...and went back to reading. 2. Could you list a few high-interest books that you think could keep a Reader engaged for next year? I haven't found one yet. Whoever does know...let me know. 3. Do you have any suggestions for how to improve the Read-a-thon next year? no improvements needed, IMO. 4. What do you think worked really well in this year’s Read-a-thon? I think the Twitter chatting is wonderful! 5. How many books did you read? I didn't start reading until 5/6pm CT. I read 104 pages of Dante's Journey by JC Marino and 100 pages of A Game of Thrones by George R.R. Martin. I'm enjoying Dante's Journey, but I have to say that A Game of Thrones is absolutely excellent! 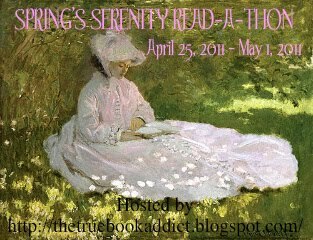 Just a reminder...my week long Spring read-a-thon, Spring's Serenity Read-A-Thon, is coming up at the end of this month. I will have the sign up post up tomorrow. I hope you will join me for a laid back week of read-a-thon reading. Congrats on doing the readathon! I'm in a bit of a reading drought. I might be out of it by your spring readathon. I love the picture you have for it!! Sounds like this was totally enjoyable. I joined one year and had fun, but just did not have time to devote this time. Oh, I like the questions at the end of the readathon. :) Great idea. I'm about ready to do a readathon of my own here soon. :) I like to just take a weekend and get lost away in my bedroom for a long while. But I think that will not be for a few weeks. Actually, now that I think about it not until May. That is a bummer.